Imagine if you could have a professional trainer in your own home showing you exactly how to deal with every situation that comes up with your puppy. Well, now you can. Who is the Head Start Program for? Our Puppy ‘Head Start’ program is for dogs from 8 weeks to 6 ½ months of age. experienced some frustrating issues, we can still help you remedy all of that and get you and your puppy back on the right track immediately. The puppy “Head Start” program is 3 private lessons over a 3 week period at your location. You get specific homework assignments to do with your puppy every day. More importantly, you learn that every interaction that you have with your puppy is a “teachable moment’. We show you how to capitalize on these everyday interactions to teach your puppy to look to you for leadership, be calm and listen to you. Is the program different if your puppy is 8 or 9 weeks old as compared to 5 or 6 months old? Absolutely! The puppy Head Start Program is really customized to you and your puppy. Your questions, goals, and needs will be different at different stages of puppy raising. For very young puppies, we teach you the best ways to bond with your puppy and slowly introduce obedience skills and socializing experiences while following the “natural learning process”. For puppies that are 4 ½ to 6 ½ months old we help you deal with the “bigger kid” issues, as they become more independent and develop their own “opinions” about things. At this older stage, we also help you remedy any lingeringissues like house breaking, or socializing challenges as well as improve the functional competence of everyday, real-life obedience skills. Does these of lessons take the place of puppy kindergarten or puppy play groups? Not really. We always recommend your puppy be exposed to other puppies in this critical period so they learn to “play nicely with others”. Many people find that the typical “puppy kindergarten” doesn’t really improve their functional understanding of how to train their puppy, because there are simply too many people and puppies for a trainer to focus on. 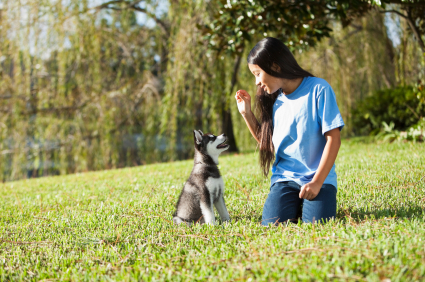 In the Puppy Head Start private lesson program, you get the undivided attention of a professional trainer, who customizes the lessons to exactly what you need at the time. Additionally, the goal of the lessons is that YOU become a much more competent coach and trainer of your puppy so you can create long term results with your dog as he or she grows up. Many clients have told us that all the knowledge that they received during the Head Start Program Loki is so-o-o-o much better now! We were thinking of returning him to the breeder but Sean taught us exactly how to handle our issues with him …. It’s actually fun to take him out to the park now! Martha and Wayne Kenmore WA “Can’t thank you enough! I felt completely underwater with Nala. I was regretting having got a puppy with how much was going wrong. I feel like I know what I’m doing now and Nala is progressing so quickly” Rachel Issaquah WA Since Max was our first puppy we were pretty nervous about what to do. Sean showed us everything step by step and Max took to training with us like a champ! We’re very grateful for all the kind with us, actually allowed them to get a lot more out of the puppy kindergarten or future play group sessions they went to later. This happens because your puppy is essentially more competent after the Head Start Program, and you can use the ‘high distraction environment’ of the puppy class to challenge your puppy’s basic skills. A lot of clients say that going to a puppy kindergarten class as the first experience in training for you and your puppy can be frustrating. This frustration sort of makes sense because the class environment is likely the most distraction environment your puppy has been in since they were with their litter. It’s a little like taking your child to a birthday party and trying to teach them math for the first time … might not be the best environment to introduce new learning challenges? We take you through all the basics of puppy raising. The first lesson is usually at your house. The second and third lesson are often at your local park or pet store. The idea is to help you train and teach your puppy in your “real world” environment. We do this so you don’t have the experience that many people that go to a typical puppy kindergarten have, where the things you learn in an obedience class don’t seem to work in your everyday life. How much does the whole Puppy Head Start program cost?